Announcing the Top Pet Toxins of 2017! The ASPCA Animal Poison Control Center (APCC) works hard year-round to help provide critical information to pet parents nationwide about the dangers of potential pet toxins. In 2017 alone, APCC received 199,000 cases concerning potential poisonings—an increase over the previous year! 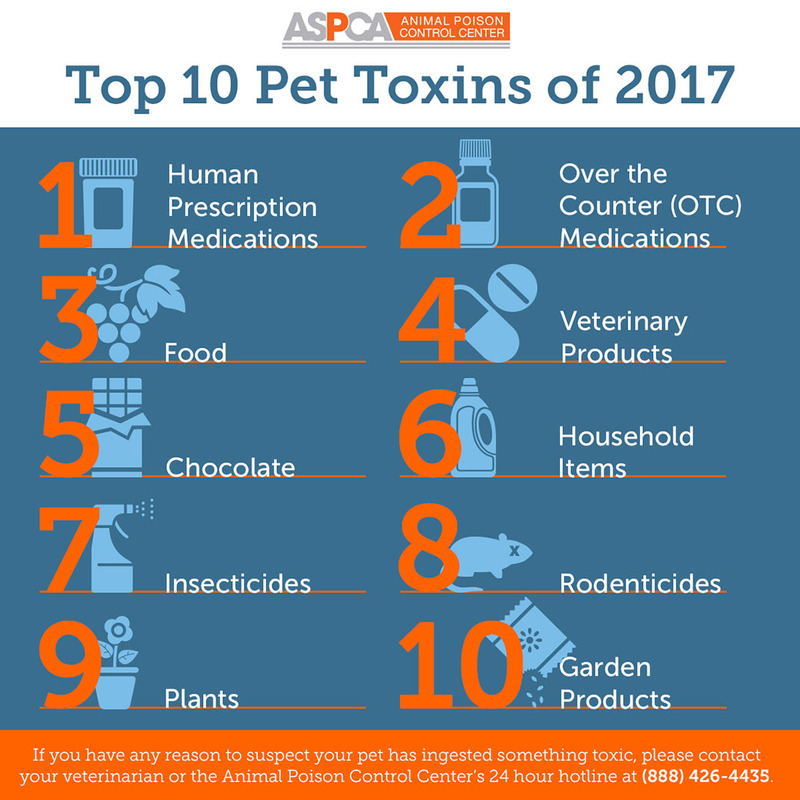 In addition, next week marks National Animal Poison Prevention Week, and to help raise awareness of common hazards to pets, APCC has released their list of Top 10 Toxins from 2017. See what made the list below! 10. Garden products. In line with last year’s results, we saw that garden products remained in the same #10 spot, accounting for 2.6% of APCC’s cases. Many pets find fertilizers and other gardening-related products irresistible. Make sure your pets are contained when you are working in the garden with herbicides and soil enhancement products. 9. Plants. Plants remained in ninth place with 5.4% (10,725) of APCC’s cases. Throughout 2017, landscaping plants, houseplants and bouquets were all sources of potential problems for pets. Lilies (Lilium sp and Hemerocallis sp.) in particular pose a serious danger for cats, while Sago Palm and Oleander plants continue to be a serious danger for both dogs and cats. 8. Rodenticides. Rodenticide exposures made up 6.3% of cases in 2017, an increase when compared to last year. The unpredictable weather patterns last year had rodents seeking shelter and food inside homes, leading to an increase in these preventative poisons. It’s important to remember that rodent poisons can be just as toxic to pets as they are to the pests they’re designed to kill. 7. Insecticides. Insecticide exposure cases continued to decrease from 2016, with only 6.7% of cases (13,307) related to these items. If the directions on the label are not followed, these products can be dangerous to pets, so always use caution when dealing with insect poisons. 6. Household items. Household items dropped one spot from last year comprising 8.6% of cases in 2017. Household items include paint, glue, cleaning products and laundry detergent, among others. With this group, proximity to pets’ environment is a common reason for exposure. Laundry pods, which made the news this year, are an up and coming danger in this group. It’s important to be mindful about keeping your pets away when using cleaning products or doing your laundry. 5. Chocolate. Chocolate toxicity made up 8.8% (17,540) of APCC cases. That works out to over 48 cases a day! While chocolate is a food, APCC gets so many calls about chocolate that it gets its own spot on the top 10 list. Dogs in particular are “chocolate fiends,” and with their good sense of smell, they are very good at finding it. Also, the popularity of chocolate as gifts for holidays like Christmas, Valentine’s Day and Easter only increases the chance for pets to get into it. 4. Veterinary products. Veterinary products made up 8.9% of cases seen. Flavored and chewable medications make it easier for our pets to take a pill, but this also means they may eat the entire bottle if they find access to them—leading to a potential overdose and complications. 3. Food. People food comes in at number three with 10.9% of cases (21,648) in 2017. Pets cannot safely ingest all of the same food items humans can. Grapes and raisins, onions and garlic (Allium sp. ), avocados, macadamia nuts, alcohol, raw yeast bread dough and xylitol are all different types of foods that can be dangerous for pets. The popularity of xylitol in sugar-free items like gum and baked goods has continued to keep this group near the top of the list. 2. Over-the-counter (OTC) medications. OTC medications made up 17.4% of APCC cases in 2017. Like last year, OTC medications came in second place in the top 10 list. This is a diverse group of items such as vitamins, pain medications (acetaminophen, ibuprofen, and naproxen), herbal supplements, probiotics, antihistamines and cold and flu medications. As with human prescription medications, most exposures are accidental. Making sure pet owners are educated about how to keep these out of pets’ reach and checking with a veterinarian prior to giving an OTC medication to a pet is important. 1. Human prescription medications. Prescription medications tops the list! Last year, 17.5% (34,888) of APCC cases were attributed to prescription meds. This group contains a wide range of medications, but pain medications, antidepressants and heart medications are the most common medications APCC receives calls about. Ingestion of the medications is typically accidental. However, pet owners unintentionally giving the wrong medication also occurs.